Transforming your yard into a native plant oasis need not be a daunting task! 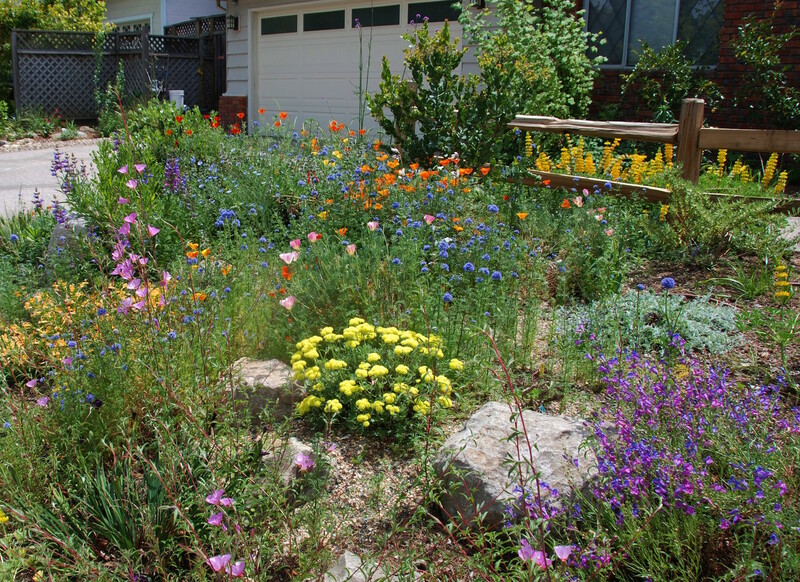 Here’s an example of a small front yard’s native landscaping by Pete Veilleux of East Bay Wilds. Designing your CA native garden is a fun and rewarding experience! Start by asking yourself a few questions, such as “How will I use this space?” or “What does this space mean to me?” Once you realize the potential of your yard, you can really get creative! Plan out your pathways, seating areas, and rain capture swales first so that you know how much space you have for plants, and what types of plants will be fit best in your landscape! Check out the CNPS article, “Have Space, Dirt, Water – Now What?” for a crash course in landscape design. Did you know that one of the most common mistakes in planning a new garden is overplanting? Make sure to get the spacing right to avoid excessive maintenance, water usage, and an over-grown landscape. Get some newspaper or cardboard and cut out a circle the width the plant will be when mature (say, 3’ wide assuming the plant you are using gets that wide). Set the newspaper on the ground and you will have a good visual on the eventual size of the plant and know how much space to leave when planting. Be sure to pay attention to the plant labels at the nursery, and don’t be tempted to buy a plant that is too large for your space! Are you choosing a plant that is appropriate for your locality, shade, soil, or drainage? Those moisture-loving coastal beauties may not be happy with the hot, dry summers of the Central Valley or Sierra Foothills. Check out CNPS’s garden planning tool, Calscape.org, for a list of plants, shrubs, and trees that are native to your location, and consider visiting your local botanic garden or attending a CNPS chapter garden tour to see examples of selections that do well in your community. Fall is considered to be the best time of year to introduce new plants to your landscape, however do see “Annual Wildflower Tests Challenge Conventional Wisdom” regarding seed propagation. If you are compelled to plant in the summer, use a shade cloth over the plant or plants so they don’t get roasted by the summer heat while trying to set root. This also allows for less frequent watering and thus less potential for root pathogens. Thoroughly water the plant in the pot the day before, or at least a few hours before, planting time. The root ball should be well-wet throughout. Dig the hole as deep as the plant is in its pot, and twice as wide. If the soil is difficult to penetrate make a small well in the soil and moisten it enough to dig. Dig the hole no deeper than the plant’s crown or a little less so the plant’s crown sits slightly above the soil line. Rough up the walls of the hole with a pick or bust bar to allow roots and water future pathways. Fill the hole with as much water as possible (three times if possible) and let it drain. This is especially important in dry planting seasons and will give you an idea how good the soil drainage is. If planting in clay soils, using small rock and decomposed gravel as part of the back fill can be quite helpful when planting plants sensitive to off season water such as manzanitas and woolly blue curls. On removing the plant from its pot, gently rough up the root ball surface to loosen the roots at the bottom and sides of the plant to be sure no root is circling the root ball which will eventually strangle the plant. Do this over the hole, so that the loosened potting mix becomes part of the backfill. Gently place the root ball so that the plant’s crown is about 1″ above the surrounding soil. If planting on a slope, place the plant on the downslope side of the hole. This is to avoid soil washing over the crown from upslope. Backfill with the soil removed from the hole, breaking up lumps and gently poking the soil around the root ball so that there’s no air pockets in the root zone. The fill should be no higher than the surrounding soil, so that the crown is above the fill. This is to keep water from sitting around the crown and introducing rot. Form any excess soil into a low berm around the outside of the planting hole. If planting on a slope, the crown will be at the top of the berm on the downslope side, with a slight depression inside the berm. On the flat, the crown will be in a slight mound in the center of the berm, with a slight ditch between the mound and the berm. See the CNPS article, Castles and Moats for Smart Drought Irrigation, for details and illustrations of this technique. Water the plant in gently but deeply, even if rain is expected that day. If it’s hot and windy, water again the next few days, then once a week for a month or until it rains. A hand held water meter to test hydration of the plant before watering again can be helpful. Place newspaper around the plant a few inches from crown and cover with mulch. Lay mulch lightly within the berm, so the rootball’s shoulders are covered but the mulch is not against the stem. See also: Tree of Life Nursery’s YouTube channel has short video tutorials on the above material to help you “Plant It Right!” for further tips and details. Don’t be afraid to experiment and have lots of fun! Contributors: Kristen Wernick, Nancy Harris, Leon Baginski, Barbara Eisenstein, Ron Vanderhoff, Rama Nayeri, Thea Gavin, Dan Songster, and Celia Kutcher. This entry was posted in Garden Design, Gardening Tips. Bookmark the permalink. You’re always so kind, Susan! Great article! I seemingly picked the worst time to plant my natives, but as a teacher, the summer is my only time to baby anything in my garden. This weekend was the only weekend my gardener was available to plant, and now I’m filled with anxiety about my new investment. We have a 1-acre property that is almost all slope. This particular slope was covered in ice plant for many years until it was wiped out like everyone else’s this last year. I covered it in Ceonathus, Salvia’s, and some evergreen shrubs like Lemonade Berry, Toyon, and Coffee Berry. My biggest issue was arguing with the fellow at Walter Anderson as well as my own gardener about installing drip, which they were insisting on but I knew from my research was not great for natives. I ended up with a compromise of drip with micro-sprinklers. Now I’m staring at this sun-baked hillside wondering if I just gave my plants the worst possible start in their new life. I need to water them heavily as they’ve just been planted, but it’s also hot as heck and I’m worried about pathogen growth. Any advice?